Hate-filled fliers left in citizens’ driveways here in Bonner County. 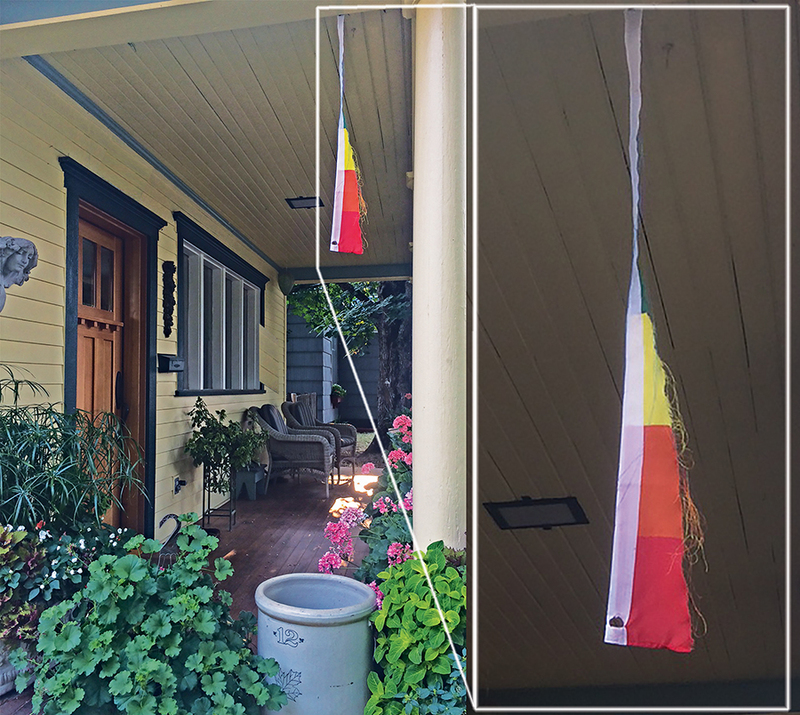 A peace flag ripped down from a local’s front porch here in Bonner County. Racist emails from dailystormer.com sent to people here in Bonner County. Community members called out by name and defamed on fliers here in Bonner County. 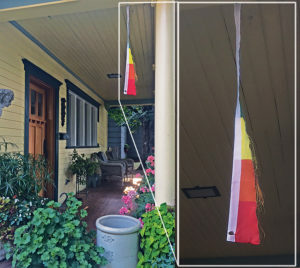 A photo of the rainbow flag torn from a Sandpoint resident’s home. Courtesy photo. To quote the opening line of a familiar song, “There’s something happening here,” but what it is is exactly clear. There are people in our North Idaho community who are using hate, prejudice, intimidation and anonymity as weapons to make other citizens feel vulnerable, unsafe, fearful and isolated. I lived in Billings, Mont., for 24 years before moving to Sandpoint. In December 1993 the citizens of Billings responded to hate crimes against the Jewish community in their town by coming together and showing unity. The Billings Gazette published a full-page picture of a menorah and encouraged people and businesses to cut it out and paste it in their windows. Thus began the seeds of the Not in Our Town project. One recent flier contains the following lines: “Keep Idaho safe. Keep Idaho clean. Keep Idaho WHITE.” At the bottom of another flier is the tongue-in-cheek invitation to “Come visit our new regional offices in Sandpoint, opening soon!” Being anonymous is how these people have chosen to operate, but finding out who they are is not what is important. What is important is that we do not succumb to their bullying — their lies, ignorance, and misinformation. What is important is that we come together as a community and take a united stand against hate, prejudice, fear, racism and violence. On the back page of this issue of the Reader is a full-page poster that celebrates Idaho as a place where “Love Lives Here.” Many organizations and citizens have come together to make this poster possible, and many more would have contributed to this cause if they had been asked. You — citizens, businesses, organizations, classrooms, churches — are encouraged to show your support by cutting the poster out and taping it in your windows. Bring this message of love into your environments. If you have children at home, have them color in the letters of “Love Lives Here” or color them yourself. Take ownership and become part of the poster’s loving message. After all, studies have shown that hate and prejudice are learned behaviors, oftentimes beginning in the home. Encourage your family members, friends, church members, teachers, classmates, businesses and anyone else with whom you come in contact to get a copy of this issue of the Reader and put the poster in their windows. Now is not the time to be passive and hope that this threat to the well-being of our community will disappear. Now is the time to declare who we are. Love for ourselves, each other, Idaho and our country is what unites us. Please tape the poster in your windows and let North Idaho know who you are and what you stand for. Next story Lake Trout or Kokanee?